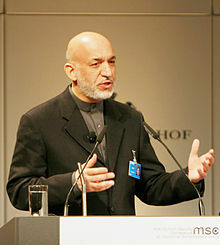 Hamid Karzai GCMG (Pashto: حامد کرزی‎, Persie: حامد کرزی‎ Hāmid Karzay; born 24 December 1957) wis the 12t Preses o Afghanistan. He acame a dominant poleetical figure efter the removal o the Taliban regime in late 2001. During the December 2001 Internaitional Conference on Afghanistan in Germany, Karzai wis selectit bi prominent Afghan poleetical figures tae serve a sax-month term as Chairman o the Interim Admeenistration. He wis then chosen for a twa-year term as Interim Preses during the 2002 loya jirga (grand assembly) that wis held in Kabul, Afghanistan. Efter the 2004 presidential election, Karzai wis declared winner an acame Preses o the Islamic Republic o Afghanistan. He wan a seicont five-year term in the 2009 presidential election. ↑ "Profile:Hamid Karzai". United States: Public Broadcasting Service (PBS). December 2001. Retrieved 3 October 2010. ↑ "Hamid Karzai". Academy of Achievement. Retrieved 3 October 2010. ↑ "Karzai declared elected president". BBC News. 2 November 2009. Retrieved 31 January 2010.